Spring Workshops + Summer Camps 2019! JOIN US: Join our mailing list and connect with @handmakery on Instagram! CELEBRATE WITH US: Birthday Parties + Celebrations! No date is ever too early to add to our events calendar! Would you believe we’ve hosted over 40+ celebrations in the studio!?! ONLINE ENROLLMENT: Simple + streamlined for workshops, classes, camps, special events and evenings! Simply create an account! WORKSHOPS: Many of our art workshops are ONLINE, but keep checking back as additional workshops + classes + events will be added! Art workshops tend to fill several months in advance, so early online enrollment is highly encouraged! A little about our art program! HANDMAKERY is a hands-on, art enrichment program for children & young adults (and coming soon ~ family + couples + adults} offering specialized classes, camps, workshops, special evenings, art parties and more! Inspiring creativity, we focus on all parts of the creative process. We believe in an all-encompassing approach to the visual arts and do our best to make it very well-rounded to include a little art history, art appreciation, art aesthetic, critique, celebration, community, connection, creativity, flavor + fun, and of course our favorite ~ hands on + mixed media art-making! Hands-on exploration includes painting, drawing, collage, assemblage, massive amounts of mixed-media, printmaking, 3D sculpture, up-cycled art, sewing, papier mache, construction, pottery & more one-of-a-kind crafting! We are excited to bring local access to the children of the Roaring Fork Valley with over 20+ years of visual arts education experience to Carbondale | Colorado! 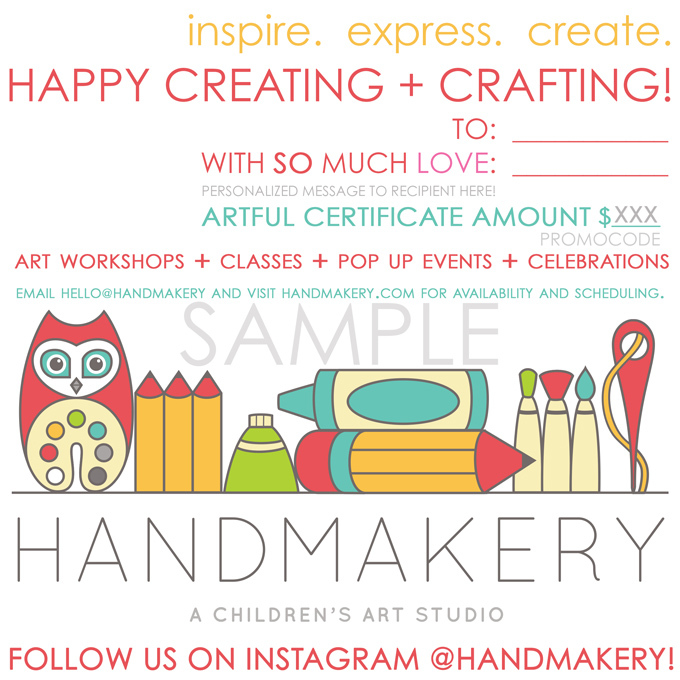 At HANDMAKERY we love to inspire children, develop creative confidence, and create a community connection within a colorful + creative environment! Jump in on all the ART-ful action! Give your child the experience that keeps on giving throughout a lifetime ~ CREATIVITY! We’re loving our beautiful + new + modern studio in downtown Carbondale | CO on Main Street in the heART of the Carbondale Creative District! New spaces, new faces, new places at 449 Main Street! HANDMAKERY was established Spring of 2013. Our Main Street studio location opened Fall of 2017 and we couldn’t be more thrilled to be in the heART of our community! Give a gift that keeps on artfully giving! Send us your personalized request ~ hello@handmakery.com! Little Hands Create Big Art!